Images via ABC and Getty. 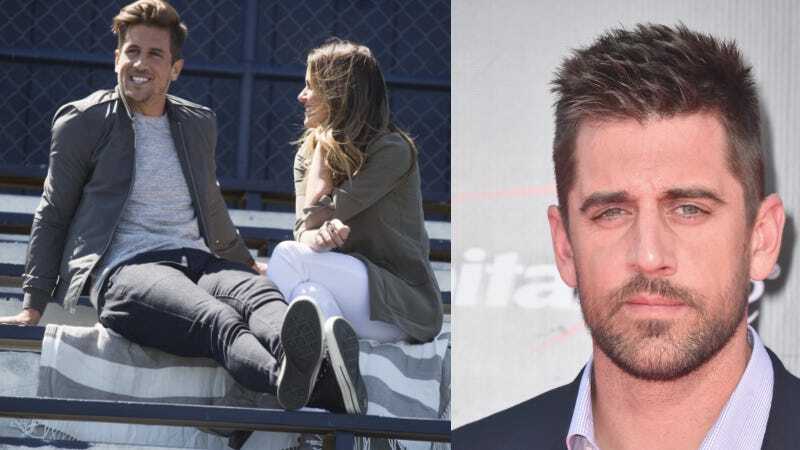 After weeks of enduring his brother blabbing his name/having his name blabbed about in relation to his brother’s name, football man Aaron Rodgers has responded to the suggestion that he and his brother, current Bachelorette finalist Jordan Rodgers, do not get along—and, furthermore, that Aaron does not get along with the rest of their family. Aaron’s response? A perfect non-response. “As far as those kinds of things go, I’ve always found that it’s a little inappropriate to talk publicly about some family matters, so I’m just — I’m not going to speak on those things, but I wish him well in the competition,” he said. Both an insult to his brother for dragging their business through the press and a note that he hopes Jordan does well in the “competition”? That’s beautiful. Aaron’s managed to dodge direct media scrutiny on this line of questioning due to the fact that football is out of season right now (he was quizzed on his brother’s antics during training camp). Some watchful viewers assumed he’d have to answer these questions earlier, as he was recently on Bill Simmons’s show, and Simmons is a Bachelor viewer, but given the chummy nature of that interview, they likely talked about that stuff off-camera. Congrats to Aaron for this stellar play. I wish you well in your competition in the game of football, and I mean that sincerely.